Staff Correspondent: Bangladesh is the second largest garments exporting country in the world where Masco Group is playing leading role in Knit garment export starting from July 2001. It is a vertical set up knit composite factory with all in-house facility and modern machineries run by dynamic manpower to provide best possible services. Behind the success, there are a group of dynamic, smart, intelligent and skilled corporate persons led by ATM Mahbubul Alam Chowdhury, also popularly known as Mahbub Milton. He has been serving as the Executive Director of Masco Group. When he joined this company in 2007, the annual business turnover of Masco Group was $17 million. Today's turnover is more than $160 million. Prior to that, Mr. Mahbub held important positions in Beximco and Interstoff Apparels Limited. 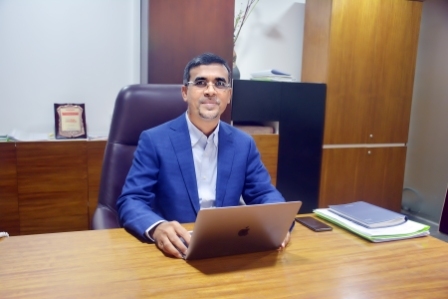 Recently, in an interview with The Apparel News, he has highlighted the future of Bangladesh's ready-made garment industry, conditions of human resources, issue of sustainability, challenges of this sector, possibility of exporting garments to the new markets, and especially contribution of the knitting sector in our total industry. The Apparel News Executive Editor Ibrahim Khalil Jewel has taken the interview, which is presented below for the readers. The Apparel News: How do you see the prospect of Bangladesh’s apparel industry in next 20 years? Mahbubul Alam Chowdhury: Thank you. Personally I am an optimistic man. Secondly, I see lots of potential at garment industry in Bangladesh. Look at the possibility that now we export $30 billion yearly in the apparel sector. But the size of the apparel market worldwide is 560 billion dollars. By 2020, this size will be about 650 billion dollars. So if we look at the difference between $ 30 billion and $ 650 billion, we can see the ‘huge gap’. As the gap is much more, there is also huge opportunity here. Why is this opportunity? If we look at apparel business, we would see that our main competitor is China. But now China doesn’t consider garment business as a major industry. Because their workers’ wage increased in a massive way. That's why their market share will be divided among other countries. So, Bangladesh has a chance here. We have the opportunity to accept this scope. Besides, our industrialists are also very desperate to take advantage of this market share. Now if we can materialize the capability that we have developed today, then I think in the next 20 years we will be able to take this sector to a new height. The Apparel News: What are the main challenges before Bangladesh’s garment industry in coming days? Mahbubul Alam Chowdhury: Well, there are many challenges here. If we say this in the form of a report, we would mention the report of US global management consultant McKinsey & Company, where four challenges of the garment sector of Bangladesh were focused. These are: infrastructure, political stability, employees’ skill and sea-port capacity. Personally, I think that the biggest challenge is the human resources. We know that BGMEA had set a target of exporting $ 50 billion worth of apparel items by 2021. It’s a very tough target but if we want to go with $ 40 billion by this time, then our first challenge is to develop human resources. We need a lot of skilled manpower in different levels. Secondly, we have to give great importance on the infrastructure building. Because, nowadays, buyers are giving us challenges such as shorter lead time. We will try our best from the production level increasing the human resource skills and management skills. But if infrastructure supports us, we can reduce the lead time too much. Large buyer-companies are now trying to get delivery of their products within 20 to 30 days. That's why the infrastructure is much more important. The capacity of the ports is also very important. The Apparel News: Please tell us something regarding your career. When did you start and what was the motivation to choose this career? Who did inspire you? And, finally, how are you enjoying your profession? Mahbubul Alam Chowdhury: Well, I would say that I had selected my study in a 'funny way'. I'm a textile engineer. I had no dream that I would be a textile engineer. When I got chance at Textile University, I met my uncle for his suggestion as I got chance for admission at Dhaka University also. My uncle advised me to study in a place where I would be able to lead my working sector. That's why I actually came to textile sector. That time I could not think that such a big contribution (83%) in the export would be from this sector. I was interested to be an economist, although my father wanted that I would be a doctor. After completing my education in textile, my career started at Beximco Textile. I spent many years there. Then I switched over to Interstoff Apparels Ltd as General Manager-Production. Now, I have been with my current company Masco Group for the last 11 years as its Head. If you say how I'm enjoying it, I would say definitely I am enjoying much my profession. Because, every day we get new challenges. It's not a monotonous sector. There are many opportunities in this sector. Many talented youths have already been here. More talents need to come to make the sector more prosperous. The Apparel News: Technology, particularly the Robotics and artificial intelligence (AI) are being introduced in garment industry largely. How will it impact on our total RMG industry, according to your opinion? Mahbubul Alam Chowdhury: Artificial Intelligence did not actually start in Bangladesh. It is true that 75% of the customers we work with are investing in artificial intelligence for their interest to reduce manpower. However, this is a long-term project. Only a few projects in China have started with direct Artificial Intelligence. We have not started here yet. But there is a lot of automation in Bangladesh. This is for reducing the dependency on the human beings in the factory and to become cost effective. The Apparel News: What is the potential of knitting industry in Bangladesh? We know that latest technology and automation have brought a revolutionary change in knitting sector throughout the world. What is the scenario in Bangladesh in this regard? Mahbubul Alam Chowdhury: O.K. If we want to achieve overall growth in apparel and textile sectors, then definitely we have to attain growth in knitting sector. But if we consider the knitting sector separately, we would say that we are just working with some basic products. We have a great opportunity to produce many diversified value added products. We have done very little work on polyester based, polyamide based or loose-knit based structures. Ofcourse, raw-material crisis is also responsible for this. There is also infrastructure crisis. For example, we did not do any work in the segment of Jacquard and Semi-Jacquard. Here I have a different perspective. That is, the culture of our Knitting sector has been made in such a way that concept of composite has only been developed. As a result, if we think of knitting as a complete business house, we will observe that we can run the business with only 65% to 70% efficiency. Because, the knitting machine needs cloths of different diameters; different types of gauge are needed; there are many setting parameters also. What are the cultures in other countries? There they set up the knitting company as an independent one with some special machines. Other manufacturers bring their works there. In those factories, the efficiency level is 90% -95%. That means, utilization percentage of their machines is too higher than our machines. As a result, when we go to the knitting sector for investment, we don’t find the sector attractive or profitable one. That's why, knitting has grown for our necessity but not for the business. If we talk about Jacquard machines, Semi-Jacquard or special knitting machines, we will see that we cannot run these with more than 10% to 20% or 30% efficiency. Then, it becomes difficult to make these feasible. But today if we can make a 'hub' in Bangladesh where only semi-jacquard machines can be found, and where only semi-jacquard or jacquard are done, then all the customers will go there. Then utilization of the machines will be much higher. In that case, I would say, it can be a profitable venture or business. The Apparel News: What is the future of woven? 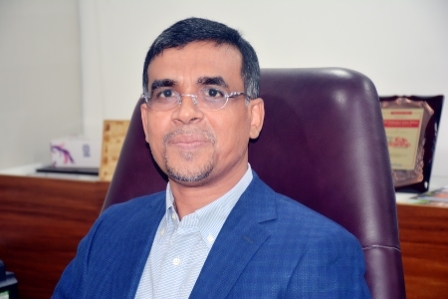 Mahbubul Alam Chowdhury: If we separate three sectors, namely- knit, denim and woven, we will find that in Knit sector we are almost self-sufficient. On the other hand, globally Bangladesh is now a focal country for Denim. But our dependence on other countries for specialized fabrics for the woven is still much higher. That’s why we have to establish more vertical setup especially fabric mills. After all, we need strong backward linkage. However, in case of woven, the biggest challenge is human resource crisis. For that reason, we couldn’t be price competitive and growth also was not achieved at the expected level. So, it could be said that the future of our denim and knit is brighter than woven. Now, many entrepreneurs are coming with new investments in woven sector, which might enrich the sector. The Apparel News: Earlier you mentioned regarding the BGMEA target? What’s your evaluation? Mahbubul Alam Chowdhury: Bangladesh has set a target of exporting of $ 50 billion garment products by 2021. It's a great dream. I thank if a man doesn’t have a dream he/she cannot go a long way. If we had no target before us, we could not tell that 30 billion dollars were exported and there was a gap of 20 billion dollars. Now, three years’ time is remaining to achieve 20 billion dollars. But when we had set the target, some homework should have been done. We could not take all actions we needed to take. For example, we have gas-crisis in the industries, although the importation of LNG as a substitute of gas in 2018 came as good news for us. Maybe, we could not have done it before. If the import of LNG was done in 2015, today the export could have gone from 30 to 35 billion dollars. Secondly, Growth has been observed in other sectors also. We have been experiencing a normal growth of 8 to 9 percent continuously for last decade, although the last year’s growth was a bit slow. We expect a good growth this year, around 8% to 9%. The Apparel News: I wanted to know whether we could meet the local demand by locally produced fabrics. Mahbubul Alam Chowdhury: Earlier I hinted that in the Knit sector we can meet 90-95 percent demands of the fabrics. In Denim, the big support of clothes is available from Bangladesh. But we are far behind in woven production. Mahbubul Alam Chowdhury: I agree with you. I was just saying that the biggest challenge in our RMG sector is the lack of skilled human resources. This problem is not only on worker level, but from all levels including management. Not only in our country, there is a shortage of skilled manpower for such sectors in all the countries. However, the crisis in our country is a bit more. The biggest way to overcome this crisis is to invest more in developing human resources. Today we are investing in many places. We are getting 175 green factories. Top 7 green factories of the world among 112 are located in Bangladesh. We are certainly proud of these achievements. Our industrialists have great contributions here to help the country reach such a prestigious position. However, I would like to make an appeal to the owners of the industries and to the top managements for allocating a budget, which will be spent on creating skilled manpower providing professional trainings. The Apparel News: As much as we have learned from the media and various reports that there are many legal/illegal foreign workers at mid-level management in the RMG sector of Bangladesh. Many have come here with tourist visas and are now working in the factories. Their salaries are much higher than our local staff. There is an organization named Bangladesh Garments Executives Association (BGEA) who has been demanding not to appoint foreign workers. What is your opinion in this regard? Mahbubul Alam Chowdhury: My idea is different. I don’t want to differentiate whether they are foreigners or not. When an industrialist sets up industry, he/she has to invest a lot. To make their investment viable, they want their company to run efficiently. If this is done with the local people, that’s OK. If they think, in some cases they need foreign manpower, they can rely on them. But my suggestion here is to observe the areas in which foreigners are working and in which areas they don’t work. We will also take it into consideration whether our educated people have the opportunity to replace the foreign workers. Then we have to take a long term plan and train up our own executives to replace the foreign mid-level executives. I can say with pride that in Masco Group there is no foreign worker from the beginning. Today, we (Masco) are the third or fourth largest knit composite factory in Bangladesh. The company is doing business worth more than 160 million dollars. We never felt that we needed foreigners here. Because, we all tried together to create an environment so that we could run the organization smoothly and efficiently. My owners also never thought of hiring foreign employees here. But yes, if we want to set up a design studio, want to develop a new design, I think we will not get proper manpower here. Moreover, in buying and merchandizing offices they need people with communicating skill. Here foreigners get priority. So, I will not say irrespectively that foreigners are necessary or unnecessary. The Apparel News: You are the Executive Director of Masco Group. Would you say about your company’s business growth and goals? The Apparel News: Which factors have worked behind the success of Masco Group? Mahbubul Alam Chowdhury: Factors are - you have to dream and have an aggressive attitude to materialize the dream. You have to use some tools. There are specific definitions of those tools in modern studies. We believe in the concept that runs our company is ‘Kaizen Continuous Improvement'. We started another culture in our company. That is ‘company wide activities’. If we can keep it running, implement continuous growth tools and build it through a proactive company, then there will be a wonderful team building. This team will take away the company at the peak of success. The Apparel News: Workers’ minimum wage has been fixed at Tk 8,000 which will be effective from December. How do you see the development? Mahbubul Alam Chowdhury: This is definitely a big challenge. Because, we saw a scale was declared, which increased 53% of salary at a time. It is difficult for an industry to pay such a large amount of wages suddenly. But if we look at the employees, I personally would opine that they should get this amount of money. Because, if they cannot live in a minimum environment, they will not become skilled. If the salary is much less, people will not be encouraged to come to this sector. So this amount of salary is needed. On the other hand, we have to see the capability of the owners also. There should be a balance between these two. Here, I give you an information. In garment factories, value added activities are only 12% and non-value added activities are 88%. If we can increase this 12 percent and reduce non-value added activities, it will be possible to deal with these challenges. Besides, the buyers have to come forward with the willingness of giving higher price for the products. Because, we had invested a lot for the sustainability, for the infrastructure and safe building structures to comply with their different demands to improve the conditions of the factories. The Apparel News: Why Bangladesh has not yet been able to create an international brand like H&M, Tesco, Zara? Mahbubul Alam Chowdhury: I cannot specifically say why we could not do this or whether we had any effort in this regard. But, the time has come to think about this. I'll say it in another way. In a report by McKinsey & Company, the global apparel business is moving more towards online. According to the report, about 50% of the departmental stores in America will be closed by 2020. The online business in China has increased tremendously. So, it can be done through online platforms. The capacity of China and India is increasing. They are also likely to be our strong buyers. Export from Bangladesh to Korea has started. Let me give you an information, though our exports to India are lower, it increased last year by 214 percent. The scope of export to India, China and Korea is growing. So, I think that we can take the initiative to create a Brand image through the online platform. The Apparel News: How do you see the possibility of apparel export in the new markets? Mahbubul Alam Chowdhury: There is a lot of possibility, if we mention that Japan is the fourth largest clothing importer in the world. About 84% of their total garments is still imported from China and 16% from other countries. Here, Bangladesh contributes 4-5 percent. It may be upgraded to 6 percent in recent times. Japan’s policy is that they are trying to find a new country as ‘China+1 Country’. Here is an opportunity for Bangladesh to establish itself as that country. Japan can be a huge market for us if we can create an Action Plan by identifying the gaps. For example, once we could not export to other countries than the America and Europe. Recently, Australian market is dominated largely by Bangladeshis. We need to travel much more to catch the new markets. In this regard, we need to know their culture, business strategy, business areas and business methods. The Apparel News: Where do you want to see yourself? Mahbubul Alam Chowdhury: It’s really difficult to say. We talked about dreams, but we don’t really dream about ourselves. Yes, if I talk about my professional career, I would say that I am at a peak point of my career. I don’t have a chance to get more than this. I am personally working with other sectors outside the textile for our company. I work there with great interest. Secondly, since I am at the highest level of my professional career, I want to make some contributions for my sector. This year I have done many programs for skill development. Maybe those programs will be increased a bit so that the country or an industry gets benefited by me. The tools that I consider to be the most powerful means is 'company wide activities'. It is possible to bring revolutionary changes to the whole sector, not just an organization. I firmly believe that through this tool it is possible to radically change a country. The implementation of this tool has been very successful in our company for the last two years. We will call on other organizations - if we can implement these tools, we will all be prosperous. Finally, if I can get a chance to keep contributing for the next generation in a specific area, I would feel that I have succeeded in my life.